Ok, ok! I admit it. It’s so bad…it’s like I can’t get away from this dirty secret: I can’t get my daughter to eat anything but corny-dogs on a regular basis. No, really. The kid is a nut. She just loves corny-dogs so much. And chips. Always chips. BBQ ones. She would literally eat this combination every day. And I had a tragedy occur yesterday…I RAN OUT OF CORNY DOGS! Yes, tragedy. But, that’s ok. 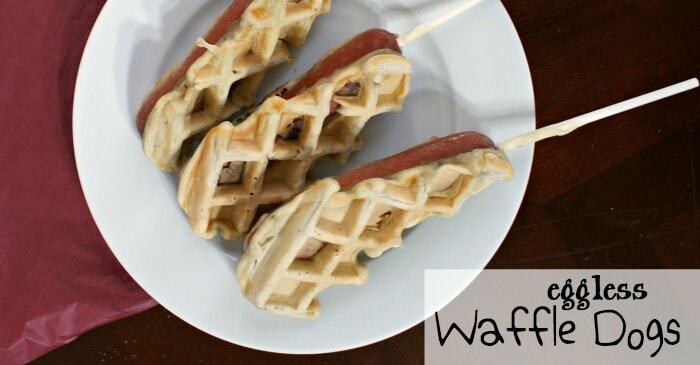 I totally found a way to keep my daughter from coming unglued…Eggless Waffle Dogs. It’s a waffle. It’s a hot dog. It’s a corny-dog that’s even cornier than a corny dog. I’m serious. Very silly. Heh. These are so awesome, though. I had to try one after smelling hers cooking. She was so pleased, too, just munched-down on it like it was a regular corny dog…then asked for a second (which is kind of unusual, but she did wave it around like a wand and refuse to eat it–but she’s 2, so I’m never sure exactly what she really wants…apparently she really just wanted a fairy-wand). That’s it! She’s totally in love with them because they’re like a little fairy wand of corn-doggiery-ness! So awesome. I’m glad I made that connection. Now, I’ll know. LOL! The best part about this non-corn-dog-corn-dog is that it’s totally allergy-friendly. Dairy-free, eggless, AND sugar-free, it’s just like a yummy alternative to her favorite meal. I made it with bananas in the waffle batter, so even without eggs and sugar, it’s slightly sweet and sticks together. Which is awesome with a side of awesomesauce. I wish all my recipes were this awesome. And this easy. I made it, slapped it in the waffle iron and handed it to my daughter. Less than 10 minutes, total. ROCKED. Merry Christmas to ME. LOL! 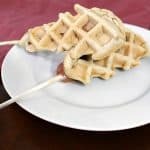 Eggless Waffle Dogs. It's a waffle. It's a hot dog. It's a corny-dog that's even cornier than a corny dog. I'm serious. Very silly. Heh. Mash banana and immediately add coconut milk and vinegar. Combine dry ingredients in a second bowl and mix until well combined. Add wet ingredients to dry in 1/3 increments and stir until batter is smooth. Insert cake pop stick into each hot dog. 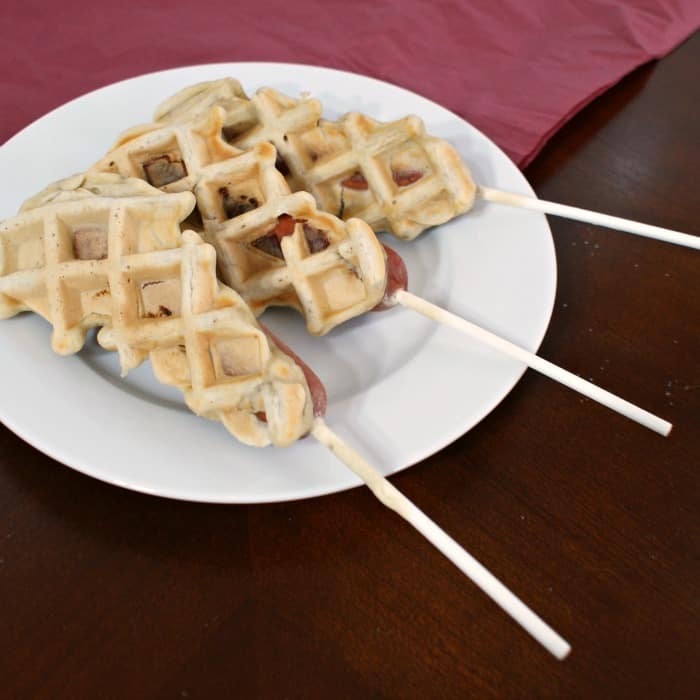 Dip one hot dog at a time in the batter, then place in the waffle iron. 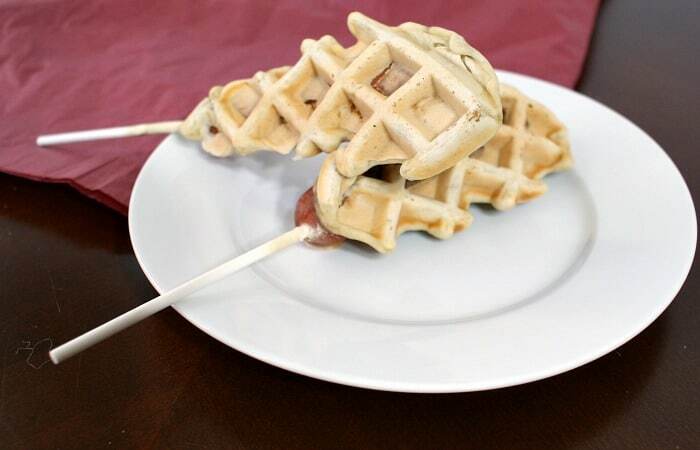 Spoon approximately 1/4 cup of batter over the hot dog, then close the waffle iron. Cook until steam is minimal, which should be pretty quick, since this is a small waffle. Remove hot dog and repeat until all hot dogs are ready for your little monsters to devour with delight! Let me know if you have any other fun suggestions for corny-dog replacement meals! LOL!